This study is about the continual stride between 1860 and 2010 amongst the various interest groups involved with what the city of The Hague should look like. The thesis of the study states that the fragmented image that people in the city have or experience is the result of the wide variety of urban ensembles and public buildings, whether or not they are crowded together or even completed, that were successively presented and implemented by the interest groups involved. Stakeholders such as national and local politicians, the royal family, banks, industrialists, housing corporations, developers, architects, urban planners, and organizations of critical citizens have always been in conflict about what public buildings or iconic urban compositions should look like. With the best of intentions each group wants to shape the city with public buildings and urban compositions in their own way and the urge to achieve this is always playing a role in the background. It is as if the city is being stripped of space, movement, and time and that only the image of the city is what counts, an image that is endlessly being reproduced in the media to influence the public opinion. The scramble over the Spuiforum is just the latest affair in a long series of incidents in The Hague. The hardhearted efforts of those involved to create one balanced townscape has only delivered more fragmented images, yet perhaps this is the city’s greatest quality. It seems like just about everyone has been occupied with the Spuiforum since 2009 to the present. The battle between supporters and opponents has been going on for years. The media critics are always there looking for the next scandal, finding fault with motives that may not always be clear. However, as intense as the conflict appears now, it will soon be forgotten. Who remembers the conflict over the Willemspark or the Peace Palace? The numerous conflicts around the sea resort Scheveningen? The battles over urban renewal, the haggling around the competition for the House of Representatives or the rivalry and troubles around the The Hague City Hall? The Eurojust (The European Union’s Judicial Cooperation Unit)? The International Criminal Court? Such stormy conflicts arise and no sooner ebb away again, often into silent oblivion. And still, in most cases, the construction of the urban image is executed as planned, though often partially. Even more, the conflicts are of importance because they reveal how people experience the city and want to see it. Cracks in society are bluntly exposed this way. For example, the most monumental gateway in The Hague is that of the The Hague Police Precinct built in the 1950’s, which faces the rear side of The Hague’s progressive party’s flagship (1986-1989), the residential complex designed by Ricardo Bofill with parking access, garbage containers, and other utilities. A good observer can see the many contradictions of society mirrored in this situation in the city. Nancy Stieber (2006) gave in the book de STAD (2006) an insightful analysis on the relationship between images and the city. The city is conceptualized as a metaphor. According to her, that is one of the transformations of the urban fabric might undergo in our minds. She distinguishes three categories: the image of the city, the imagined city, and the imaginary city. The image of the city is the idea that is composed by individuals or groups: a creation that is triggered from experience of the city in the mind or a concept based on the actual city itself. The imagined city is the virtual arena conceived by artists, architects, city planners, marketers, and others through art, film, literature, music, advertising, architecture, and urban designs. This idea is certainly related to the first category, but here the focus is on the representation of the city by specialists that are making the presentations to convince people of the value and significance of an urban composition or public building. In this sense, the producers of the images are crucial since, after all, who needs to be convinced of which statement? Using a caricature on Berlage’s Amsterdam South, Stieber demonstrated that the categories are inseparable and all three are about metaphors of the city. ‘The city between the ears’, as noted by the geographer and urban marketing specialist Gertjan Hosper (2010). The goal of this study is to discover and describe consecutive city images of The Hague and the conflicts associated with them between 1860 and 2010, as well as to determine for whom, with what motive and background these city images were developed, where, in how far, and if these consecutive city images were realized, what the conflicts were about, and why the often unfinished images disappeared again, which resulted in the current fragmented image of the city. The human activities that take place in the buildings and surroundings, no matter how significant, were left out of the study for practical reasons. Every case study is of a dominant city image from a certain period. The central context is the relation between ‘the city between the ears’, the actual built city, and the many conflicts pertaining to that image. Each image will be analyzed in this study on the basis of iconic ensembles in the urban setting. The urban ensemble is iconic if it has been part of a public debate. It is unraveled by way of three aspects: the motives for and against of those involved, the shape of the urban space, and the architecture of the buildings. This study inevitably comprises multi-disciplinary research. Results of research on the morphology, typology, imagery, and historical sources are associated to each other. Aspects like urban space, development, and motives of stakeholders concerning the appearance of the locations are compared and present a new light. It’s not the knowledge acquired about the cause, a condition or situation from the past that is central to the study like in the research of a historian, but the knowledge gathered about the exchange between image and reality during a certain time frame. Throughout the case studies on particular urban ensembles, cross references are made between the histories of architecture, town planning, and politics and the social reality. The case studies chosen to prove the above mentioned thesis led to the following conclusions. The fragmented look of The Hague was directly caused by debates on the image of the city. Images of a city are a kind of visual or esthetic category that cannot be sharply defined but rather have something intangible and are fluid. Only at the project level can images be bright and clear. All of the city images were found to run a certain course in time of no longer than a 20 to 30 year time span. The image of the city is not always visually homogenous or in one particular style, but can instead be diverse. It also tends to bind places together that are distant, such as typical Dutch cauliflower neighborhoods from the 70’s, which can be found throughout the country. City images can also unite local and international aspects of the city and are more successful and domineering when there is a high development rate. In this respect, there are some large gaps in the historical context, blank areas where there was hardly any building development going on. There is always a motive behind the city image: the spontaneous city is fictitious. However, the motive is often forgotten whereby people wonder later on about the consistency between urban space, development, and the imagery that was used in the development process. As townscapes appear with new city images, they seem inadaptable. They are destructive and intolerant towards their predecessors, especially when those images rise within the existing city. It is normal to demolish an area to a build new ideal. The role of the stakeholders like architects, urban designers, and officials is highly overrated. It is the synergy between them and the context that is crucial. The city image plays a unifying and sometimes persistent role under these conditions, reminding us: the city, that’s us. On the basis of the study on the image of the city it is possible to draw the map of a city differently, precisely because that way the differences between cities become apparent. OORSCHOT, Leo. Conflicten over Haagse stadsbeelden. Van Willemspark tot Spuiforum. 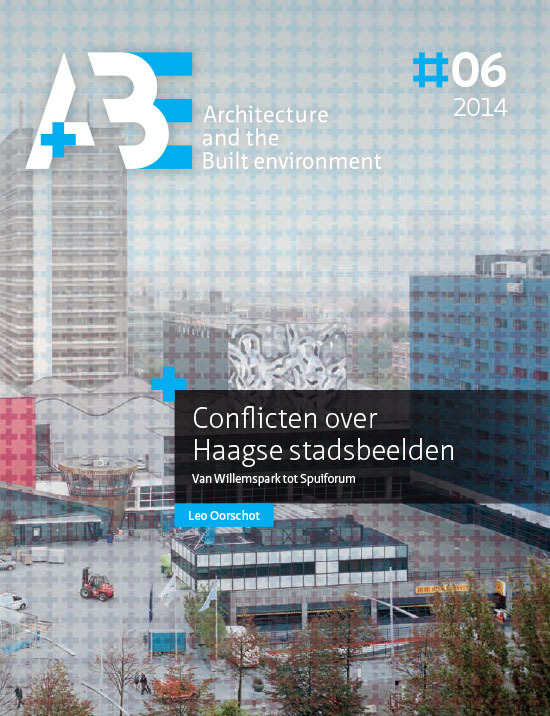 A+BE | Architecture and the Built Environment, [S.l. ], n. 6, p. 1-655, june 2014. ISSN 2214-7233. Available at: <https://journals.open.tudelft.nl/index.php/abe/article/view/Oorschot_article>. Date accessed: 20 apr. 2019. doi: https://doi.org/10.7480/abe.2014.6.652.